On September 15th, the Fed met and voted to keep rates at record lows, delaying any increases for now. 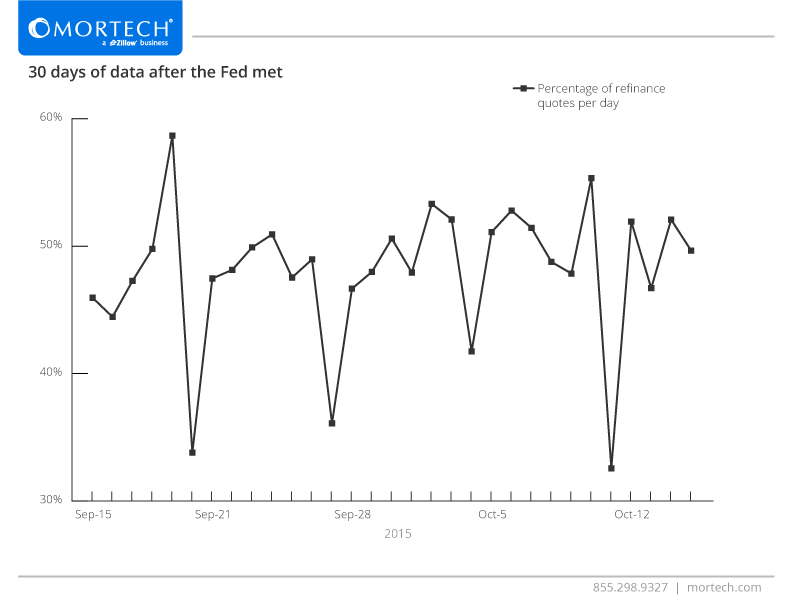 Now that we’ve had a little more than a month to allow the waters to settle, we wondered what the announcement had done for quote volume, and if there were any indicators that the Fed announcement had spurred anything in the market. Pulling data from within Marksman, we took a look at the numbers. 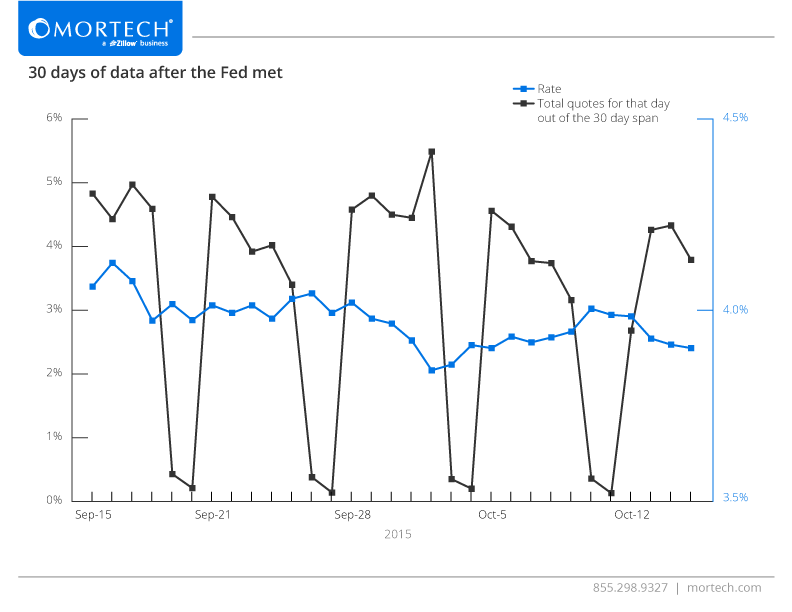 Interestingly, this data shows that it was mostly business as usual, save for two occurrences. The first is the small spike in quote volume on the 17th. That day accounted for almost 5% of the quotes over that 30-day span after the announcement occurred, higher than any other day except for one in that period. This was also the day before a significant rate drop, which means that there’s a good chance this actually was due to the Fed announcement, rather than people taking the opportunity of lowering rates. The other instance was on Friday, October 2nd. Looking at each week on the graph, in a typical weekday, the highest quote volume was on a Monday, with the value diminishing slightly each day of the week, and dropping off on weekends. However, on the 2nd, when rates were at their ultimate lowest point in the 30-day period, quote volume for the period spiked, hitting about 5.5% of the total. Taking this a step further, we didn’t just pull the quote volume numbers, but also the percentage of those daily quotes that were refinances. With the decision to keep rates low, the idea was that people would want to get in and refinance with the guarantee of low rates. I mentioned earlier that the spike in quote volume just before the rate dip on September 18th was interesting, as the rate is typically the driver for any volume seen in the industry. This point is highlighted when checking the refinance numbers, which hit their highest point for the 30-day span by a pretty hefty margin. People were likely waiting for the first big drop after the Fed announcement, which makes sense; there’s no point in going in and refinancing when you already know rates are going to stay low, so giving a little time for another drop is logical. The other interesting point of this data was on the 10th, when refinances spiked once again; although, this time instead of a sudden drop in rates, it was due to rates starting to climb. Again, this makes sense - rates had been consistent for four days prior to that point, so waiting to see if they go down a bit more or start to climb again before making a move is another logical step. With rates clearly being the biggest driving factor for events such as quote volumes and people refinancing, it’s important for you and your business to be putting the most accurate rates out to potential borrowers. Schedule a free demo with Mortech today to find out how Marksman can not only put out accurate rates quickly, but can also widen their reach to an even wider potential borrower base.